this weekend. Click image to scroll through full list. It's a very broad collection consisting of about one billion records. Click the image, right, to scroll through the various collections that are free of charge for the next few days. To take advantage of the free access weekend you'll need a registered account. If you don't already have one, it's a quick process and you don't have to provide any personal details beyond name and email. No financial details are requested. Once you're set up with a free account, the collection of listed records will available free until 11:59pm on Monday 20 February. 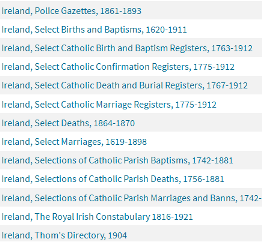 NOTE: Ancestry.com is also providing a weekend of free access to the same Irish and UK records, even if its landing page describes the collection as British! If you have a registered account through the .com site, the free access will expire at 11:59pm ET on Monday 20 February. Here's Ancestry.com's free access landing page.